I was introduced to Dr Patricia O’Brien in early 2012. At that time, she was at the start of her journey exploring the life of my grandfather, Ta’isi Olaf Frederick Nelson, and the period of Samoan and world history in which he lived. In May that year, I met her in person for the first time in Tuaefu. She had come to Samoa to give her first lecture on her research. I was impressed by her passion for the period and by her meticulousness. I was silently hopeful that my grandfather’s story might finally be told. Histories of countries and societies are family histories. For Samoans, they are family histories because Samoan society is defined by and functions through aiga or family connections. The faasamoa is made meaningful through the framework of aiga. Put another way, our Samoan identities or our faasinomaga lives and breathes through these connections. As connected beings Samoans acknowledge the sacredness of that connection and frowns upon anything that would breach this sacredness or va tapuia. Historical knowledge has the potential to breach va tapuia. The writing of Samoan history is not easy. As acknowledged by Meleisea Malama Meleisea at the Samoa book launch of Tautai last Saturday, it requires a lot of resources and the availability of highly skilled and diligent scholars like Patricia. Meleisea also acknowledged that given the highly political nature of Samoan history, historians who decide to tackle it must have sensitivity to the multiple levels of storying involved. For me this means the ability to discern truth from fiction, a transparency of methodology, and a commitment to the relational aspects of storying. For the children of Ta’isi this book has long-last brought some peace. 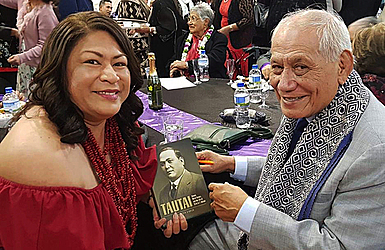 As acknowledged by Meleisea, the significance of Ta’isi’s contribution to the Mau movement, to Samoa’s fight for Independence, has not, until this book, been properly told. This is a huge admission for a Samoan historian and I thank him on behalf of our family for his courage. When Helen Clark, in 2002, on behalf of her government and the New Zealand people, apologised to Samoa for the injustices caused by the New Zealand Administration during its colonial rule of Samoa, she forced us to recognise many things. The most salient of which is what this book offers: that there is a need for us to revisit and retell the story of the Mau. We will always remember the courage and sacrifice of Sir Maui Pomare and Sir Apirana Ngata, as Ministers in government, who stood against their own government in support of the Samoan Mau cause. They did this because they are fanauga; they are our ivi (bones), our toto (blood) and our aano (flesh). The power of aiga (family) lies in the fact that as the Samoan saying goes, O uo i aso uma a’o uso i aso vale, meaning, we turn to friends in times of good fortune, and family in times of distress. This book, is a book of redemption and of hope, it offers redemption for the pain caused by the unfair silence that surrounded the truth of the Mau. It offers hope to the young that it is possible to do good, sensitive, well-researched, nuanced and balanced Samoan history. Even if it took an Australian to do it. This in itself says something. I leave you with my fondest memory of my grandfather. I am the eldest male grandchild of Taisi Olaf Nelson. At 9 months old, I was weaned off my mother and taken, as per Samoan custom, to live with him and be raised by him. I will never forget running as a child every morning to pick pink flowers from the gardens in Tuaefu, and where I saw mangoes that had fallen off the tree, I would pick them up, even if rotten, to give to my grandfather. He would take them in his hands, as if they were diamonds, and would smell them, as they were the most fragrant and most beautiful things in the world, and then place them pride of place on the kitchen table with strict instructions that no one was to touch them or throw them away. This was the unconditional love of a grandparent; the unconditional love of family. This kind of alofa is what sustains us and impels us to go beyond. Oe le tautai e lelei, pule i le vasa nei. Na ma fesoota’i ma Dr Patricia O’Brien i le amataga o le tausaga 2012. I le vaitau lea, ua tau amata ia lana galuega o le su’esu’eina o le olaga o Ta’isi Olaf Frederick Nelson, faapea ai ma lana su’esu’ega i le tala faasolopito o Samoa ma le lalolagi i le taimi lea na ia soifua ai. Iā Me i le tausaga lea, na ma faato’ā feiloa’i ai i Tua’efu. Na asiasi mai i Samoa e fai lana ulua’i tautalaga i lana su’esu’ega ua tau afua. Sa ou matauina lona pulunaunau ma le sogasogā o lana su’esu’ega. Sa faaosofia lava le agaga amea o le a maualafia ona tala le tala faasolopito o le olaga o Ta’isi ma le Mau. O le tala faasolopito o mālō ma atunuu, o le tala faasolopito o aiga. Mo tagata Samoa, e māfua ona tala faasolopito o aiga aua e faamatala ma faagaioi e le tu ma le aga a aiga faapea ai ma le gafa. O le faa-Samoa, e mafua ona ‘anoa ma mamafi, ona o le faavae e tausi ai aiga. A liliu i se isi faa’upuga, o le tatou tofi ma faasinomaga e tupu ma ola ona o le gafa e fesoota’i ai aiga. Talu ai le va feagai ai faaleaiga e aloa’ia e le tu ma le aga a Samoa le tapu ma le sa o le va feagai ai ma e faatautee i se mea e soli ai le sa ma le tapu o le va tapuia. E ono mafai e le mau ma le iloa o le tala faasolopito ona soli le tuaoi o le va tapuia. O le tusia o le tala faasolopito o Samoa e lē faigofie, pei ona faaalia e Meleisea Malama Meleisea i le tatala aloa’ia o le tusi o le Tautai i le Aso Toonai ua tuana’i, e moomia ia le malosi tau tupe faapea ai ma le avanoa o sikola e atamamai ma sogasogā, e pei o Patricia. Pei ona fai mai Meleisea, talu ai le lavelave o polokiki o tala faasolopito o Samoa, e ao lava ona nofo uta ē tusitusia le tala faasolopito i le lavelave ma le gaogaosā o molimau ma faamatalaga o tala faasamoa. Mo a’u o le uiga o lea mea, ia ou iloa na faavasega le tuaoi o le tala moni ma le tala fatu, ia manino ma malamalama le alāfua faapea ai ma ia agavaa e soosoo ia le mau ma le molimau e faamaonia ai le mau. Mo le fanau o Ta’isi, o lenei tusi ua avea lava ma se faaola tōtoga. Pei ona fai mai Meleisea, o le tāua o le sao a Ta’isi i le sailigāmālō a le Mau, e le’i maua se mau manino ma le malamalama vagana nei ua maua le tusi a Patricia O’Brien. O se molimau tāua ma anoa lea mai se faia’oga Samoa o le iunivesite o loo ‘ave I ai le faamuamua ma e ‘avea lea avanoa ou te momoli atu ai le faamālō i lona sogasogā ma lona loto tele. Ina ua taunuu mai Helen Clark i le 2002, e fai ma sui o le mālō ma tagata o Niu Sila e faato’ese iā Samoa ona o le pulega sauā ma lē amiotonu a le mālō faakolone a Niu Sila i Samoa - e tele manatu ma mau na lagalagā talu ai lenei faato’esega. O se tasi o mau ‘anoa o lea e faamatala mai i le tusi lenei: e ao iā i tatou ona toe asiasi ma le toto’a i tala faasolopito o le Mau. E manatua pea le loto tele ma le faitaulaga o Sir Maui Pomare ma Sir Apirana Ngata, o minisita o le mālō o Niu Sila, na o latou tulai i totonu o le Palemene ma tetee i le mau a le mālō ae lagolago i le Mau a Samoa. E māfua ona o le fanauga, ua oso le ivi i le ivi, le toto i le toto, le aano i le aano. O le malosi ma le paoa o le aiga, e maua i upu o le muagagana a Samoa, o uō i aso uma a o uso i aso vale. O lona uiga, o uō mo aso laulelei ae a oo i aso o puapuaga, e te tua i le lagolago ma le puipui malu a le tino, le toto ma le aano. O le tusi lenei, o le tusi o le faaolataga ma le faamoemoe – o le faaolataga ona ua fai ma vai mālū i le manu’a tūgā e māfua o le gūgū ma le faatauaso i sauaga sa faia i le Mau. E molimoli atu le fe’au o le faamoemoe mo le ‘autalavou, ona e faamaonia e le agalelei, le mea e su’esu’eina mae’ae’a, le molimau e malosi ma ‘anoa ona e āfua mai i le tōfā ma le faautaga lelei. Ua maualafia ona o tusitusiga a se tama’ita’i Ausetalia. O le a faaiu a’u upu i nai tala o lo’u manatua o le toeaina o Ta’isi. O a’u nei o le tama tane aupito matua o fanau a fanau a Ta’isi. I le iva masina na vavae ai a’u mai o’u mātua, e tusa ai ma le tu ma le aga Samoa, ou te alu ma te nonofo ma le toeaina ma faafailele ai a’u. E lē galo ia te a’u, o taeao uma ou te alu e tau mai teu o fualaau piniki mai i le togalaau i Tuaefu ma mago o aigāpe’a ua touulu i lalo. Ona ou alu atu lea ma taetae mai e momoli i lo’u matua tausi. E lē galo, o se mea mata’ina, lona sagisagi ma opoopo atu ia mago ma fualaau, pei o ni taimane ma ni ario, ma ua ia opoopo ma sogisogi i ai pei o ni mea sili ona manogi ma matagofie i le lalolagi nei. Ona faatonu lea o tagata o le aiga e ave i le laulau i tala ane o lona moega, ma aua ne’i lote pe ‘ave ese e se isi. O tino ia o le alofa o le matua, o le alofa o le aiga, o le ituaiga alofa lenei e lē gata e opogi ma faamafanafana ae o se faalā’ei’au fo’i, ia e alu e saili le mālō mo le aiga, mo le atunuu ma lou nuu. Ua faaigoaina e Patty le tusi o le Tautai, o se faamanatuga lea o le faatautaiga e Ta’isi o lona alavaa. O lona loto tele ma lona faamaoni, o loo molimauina e le tusi ma o se aitalafu lea e lē mavae a lenei aiga ia Dr. Patricia O’Brien. I le faamanatuina o Ta’isi, ou te mana’o ina ia faai’uina la’u molimau, i lo’u peseina, ma e talosaga atu foi i le faife’au ma le ‘aulotu e fesoasoani mai. O le pese Metotisi sa sili ona ia fiafia i ai: Iesu e, tautai lo’u va’a. O oe le tautai e lelei, pule i le vasa nei.